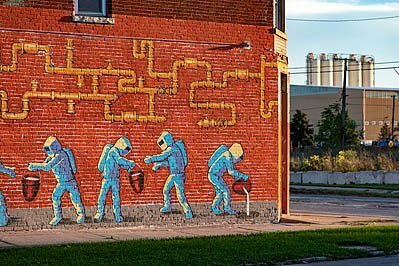 Detroit, Michigan - A mural on a building near the U.S. Ecology hazardous waste plant expresses neighborhood opposition to the facility. (The plant includes the five silos at right.) The company's Detroit plants are all located in poor, mostly African-American and immigrant neighborhoods. The company handles a wide variety of toxic materials and discharges much of it into the Detroit sewer system. Image Description: Detroit, Michigan - A mural on a building near the U.S. Ecology hazardous waste plant expresses neighborhood opposition to the facility. (The plant includes the five silos at right.) The company's Detroit plants are all located in poor, mostly African-American and immigrant neighborhoods. The company handles a wide variety of toxic materials and discharges much of it into the Detroit sewer system.